Weighty Matters: Will Weighing Yourself Daily Help You to Lose More Weight? 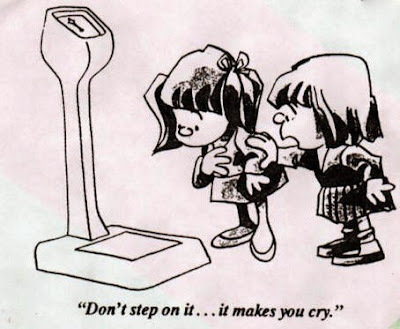 Will Weighing Yourself Daily Help You to Lose More Weight? That's what a recent study seemed to show....or did it? The study, Weighing Every Day Matters: Daily Weighing Improves Weight Loss and Adoption of Weight Control Behaviors, is one that I'd have rejected if I were involved in its peer review. The study retrospectively looked at frequency of weighing among just 47 patients who were asked to weigh themselves daily on scales that transmitted data back to the researchers. They were also provided with a weight loss program. Effectively, there were no controls as somewhat inexplicably, rather than provide the weight loss program to patients who were told explicitly not to weigh themselves daily, the "control" group was a group that was provided with zero instructions on weight management. The authors found that those weighing more frequently did better. What the authors did not ascertain was cause and effect as perhaps simply those who were doing better with their weight loss effort weighed themselves more frequently. My experience with thousands of patients says that they did, and that conversely, those who knew they weren't doing so well, were actively avoiding the scale because they didn't want to see it. Anyone who has ever struggled with weight and gone on a diet will tell you scale seduction and scale avoidance are very, very, real.